Today, the EU announced that it was to introduce by 2010 "new" life-saving technology into European cars, called E-call "as part of the EU's eSafety initiative". This will automatically notify the emergency services in the event of an accident, giving the location of the vehicle, even if the occupants are unconscious. Yet, this system has already been in use in the United States since the year 2000, where it is known as "Automated Crash Notification" (see graphic), and is being progressively rolled-out to include all new cars. Through a service provider, OnStar, by 2002 the system had more than two million subscribers and was getting about 500 emergency notifications per month. 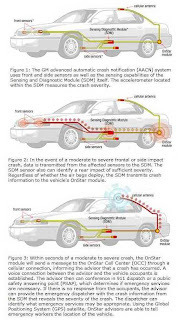 Initially, the system was triggered when the airbag was activated but, with the experience of using it and developments in technology, it has been improved to become the "Advanced Automated Crash Notification" (AACN) (see graphic below). This not only detects air bag deployments but also rear and side crashes and rollovers. In addition, AACN provides vital information on crash dynamics, telling rescuers, for example, the severity of an accident and whether it was a head-on or side collision. Furthermore, the system is connected to the vehicle's radio. 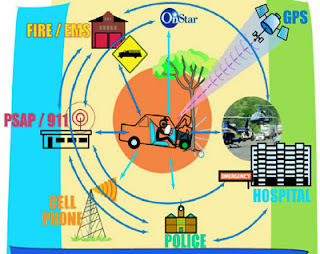 If someone is in a crash and is conscious, they can hear information coming over the radio. The system is also equipped with a microphone so that casualties can communicate with the emergency coordinator. The difference is that, in the US, the technology was pioneered by the car industry and developed, as this article describes, by an alliance of universities, medical care associations and telematic companies. Thus, in the hands of a combination of private enterprise and charities, the system has already saved hundreds of lives and will continue to do so for years to come. By contrast, in Europe, the system has been hijacked by the EU, turning it into a "European" project, complete with "ring of stars" logo (right). It is thus bogged down in politics and has yet to get off the ground. Looking at the EU end, it was actually in September 2005, almost two years to the date, that we picked up on an announcement by the EU commission on a "new" system which it had labelled E-call. Then, the commission was claiming that, from 2009, all new cars in Europe could be equipped with this technology, "under a Commission/industry action plan agreed in Brussels". At the time, we expressed grave reservations about the system as it involved satellite positioning equipment being fitted into a car - which would continually monitor the position of the vehicle – linked to an embedded mobile phone which would be used to send the emergency message in the event of an accident. This, we felt, was a Trojan Horse as the equipment, fitted for that purpose, could be used for many others – and have serious privacy implications. That much has, in fact, been recognised by the EU and the issues raised have been, in part, responsible for the delays in introducing the system. With the US, however, these issues do not arise as the system is run by private companies and there are already powerful data protection safeguards already in place. As to the current situation in the Europe, with today's announcement, we have already seen a slippage of one year but the reality is that, if the system is to rely on Galileo, the EU's satellite positioning system, this is not going to be ready until 2012 – if at all. So, already, the commission’s timescale is looking unrealistically optimistic. Needless to say, the EU is milking its involvement in E-call for all the propaganda value it can get, but the truth of the matter is that its involvement is nothing but malign. Far from saving peoples' lives, the EU is costing them. This rather gives a new meaning to the phrase, "dead hand of bureaucracy".